ZnInSe2/Cu0.5Ag0.5InSe2 diode structures have been fabricated by thermal evaporation of stacked layers on indium tin oxide-coated glass substrates. Temperature-dependent dark current–voltage measurements were carried out to extract the diode parameters and to determine the dominant conduction mechanisms in the forward- and reverse-bias regions. 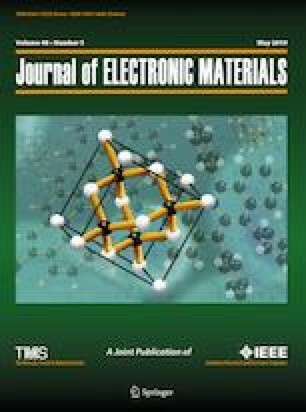 The heterostructure showed three order of magnitude rectifying behavior with a barrier height of 0.72 eV and ideality factor of 2.16 at room temperature. In the high forward-bias region, the series and shunt resistances were calculated with the help of parasitic resistance relations, yielding room-temperature values of 9.54 × 102 Ω cm2 and 1.23 × 103 Ω cm2, respectively. According to the analysis of the current flow in the forward-bias region, abnormal thermionic emission due to the variation of the ideality factor with temperature and space-charge-limited current processes were determined to be the dominant conduction mechanisms in this heterostructure. In the reverse-bias region, the tunneling mechanism was found to be effective in the leakage current flow with trap density of 106 cm−3. Spectral photocurrent measurements were carried out to investigate the spectral working range of the device structure. The main photocurrent peaks observed in the spectrum corresponded to the band-edge values of the active thin-film layers. H.H. Gullu and M. Parlak, Surf. Rev. Lett. https://doi.org/10.1142/S0218625X19500835.